IN order to avoid important free and open debate, on a system so chaotic as our climate, CAGW alarmists instinctively claim that the “science is settled” based on a purported “97% consensus” of all scientists. ANY person or body that holds a dissenting view or presents contradictory evidence is immediately labelled a climate ‘denier’ – likened to those who claim the holocaust never occurred. A classic ad-hominem attack designed to smear and silence those who refuse to comply with the preferred wisdom of the day. BOGUS 97% surveys have been concocted over the years claiming a scientific ‘consensus’ exists. However, consensus doesn’t decide science, facts do. In just the first 8 weeks of 2018, 97 scientific papers have been published that cast doubt on the position that anthropogenic CO2 emissions function as the climate’s fundamental control knob…or that otherwise serve to question the efficacy of climate models or the related “consensus” positions commonly endorsed by policymakers and mainstream media sources. These 97 new papers affirm the position that there are significant limitations and uncertainties inherent in our understanding of climate and climate changes, emphasizing that climate science is not settled. To reiterate, the 97 papers compiled in 2018 thus far support the N(1)-N(4) positions, and they undermine or at least do not support the “consensus” A(1)-A(4) positions. The papers do not do more than that. Expectations that these papers should do more than support skeptical positions and undermine “consensus” positions to “count” are deemed unreasonable in this context. Below are the two links to the list of 97 papers amassed as of 26 February, 2018, as well as the guideline for the lists’ categorization. Also included are 24 sample papers included on the list, about 1/4th of the total. (Parts 2 and 3 are on the same page). INTERESTING to see how the warmist community will spin the “science” from these latest inconvenient findings that contradict IPCC climate model predictions and the endless “Hottest Year Evah“ PR claims. NO doubt, Climate Crisis Inc … and the UN IPCC won’t go near it. And don’t expect to see empirical evidence of globally cooling oceans and thickening glaciers gleefully reported on CNN, BBC or ABC Australia. Any climate news that doesn’t fit the human-caused warming narrative is expressly ignored by the #FakeNews mainstream media, using their favoured and most effective propaganda weapon – confirmation bias. Dieng et al., 2017 We investigate the global mean and regional change of sea surface and land surface temperature over 2003–2013, using a large number of different data sets, and compare with changes observed over the past few decades (starting in 1950). 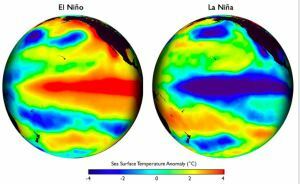 … While confirming cooling of eastern tropical Pacific during the last decade as reported in several recent studies, our results show that the reduced rate of change of the 2003–2013 time span is a global phenomenon. 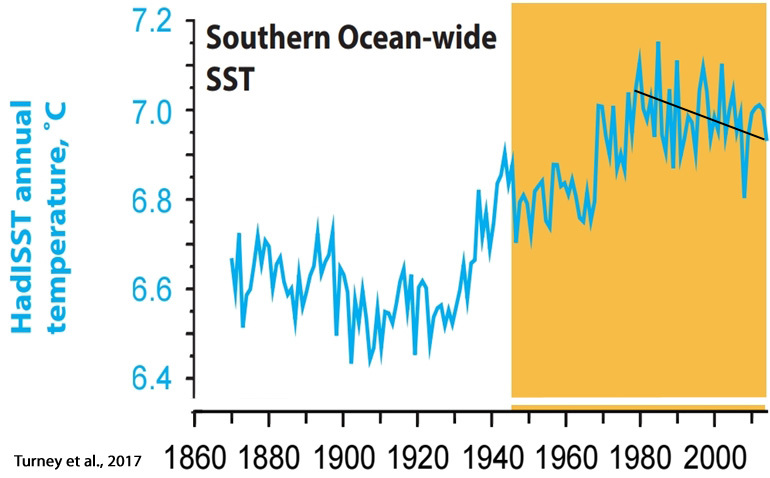 GMST short-term trends since 1950 computed over successive 11-year windows with 1-year overlap show important decadal variability that highly correlates with 11-year trends of the Atlantic Multidecadal Oscillation index. The GMST 11-year trend distribution is well fitted by a Gaussian function, confirming an unforced origin related to internal climate variability. We evaluate the time derivative of full-depth ocean heat content to determine the planetary energy imbalance with different approaches: in situ measurements, ocean reanalysis and global sea level budget. For 2003–2013, it amounts to 0.5 +/− 0.1 W m−2, 0.68 +/− 0.1 W m−2 and 0.65 +/− 0.1 W m−2, respectively for the three approaches. 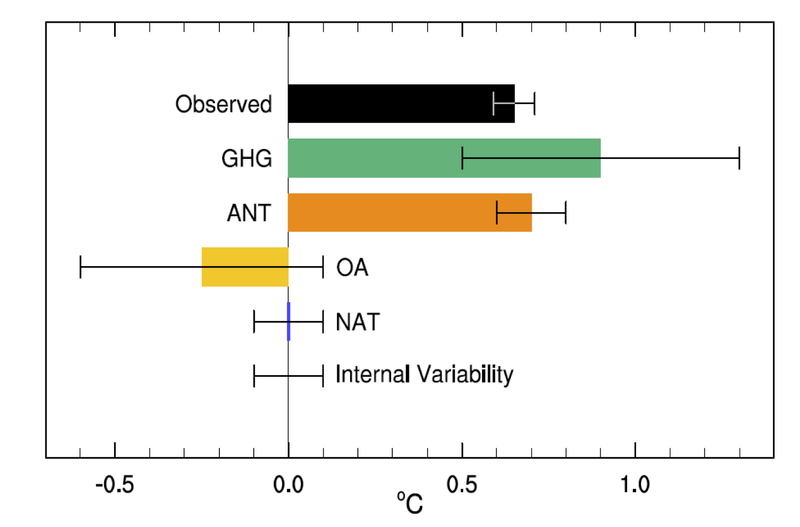 Although the uncertainty is quite large because of considerable errors in the climate sensitivity parameter, we find no evidence of decrease in net radiative forcing in the recent years, but rather an increase compared to the previous decades. We can note that the correlation between GMST [global mean surface temperature] trends and AMO trends is quite high. It amounts 0.88 over the whole time span. At the beginning of the record, the correlation with PDO trends is also high (equal to 0.8) but breaks down after the mid-1980s. The GMST and AMO trends shown in Figure 6 show a low in the 1960s and high in the 1990s, suggestive of a 60-year oscillation, as reported for the global mean sea level by Chambers et al. (2012). Thus the observed temporal evolution of the GMST [global mean surface temperature] trends may just reflect a 60-year natural cycle driven by the AMO. According to Piecuch et al. (2017) there has been no net warming of the North Atlantic Ocean in the last quarter century. The warming that occurred in the 10 years from 1994-2004 has been completely negated by an even more pronounced cooling trend since 2005. The predominant (87%) cause of the warming was determined to be of the same natural (non-anthropogenic) origin as the subsequent cooling: advection, the movement/circulation of heat via internal processes. 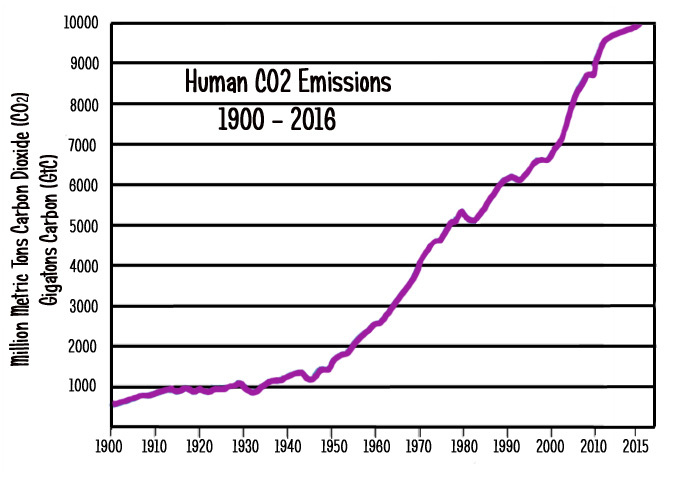 In fact, human CO2 emissions are never mentioned as even contributing to the the 1994-2004 warming. Piecuch et al., 2017 The subpolar North Atlantic (SPNA) is subject to strong decadal variability, with implications for surface climate and its predictability. In 2004–2005, SPNA decadal upper ocean and sea-surface temperature trends reversed from warming during 1994–2004 to cooling over 2005–2015. … Over the last two decades, the SPNA has undergone a pronounced climate shift. 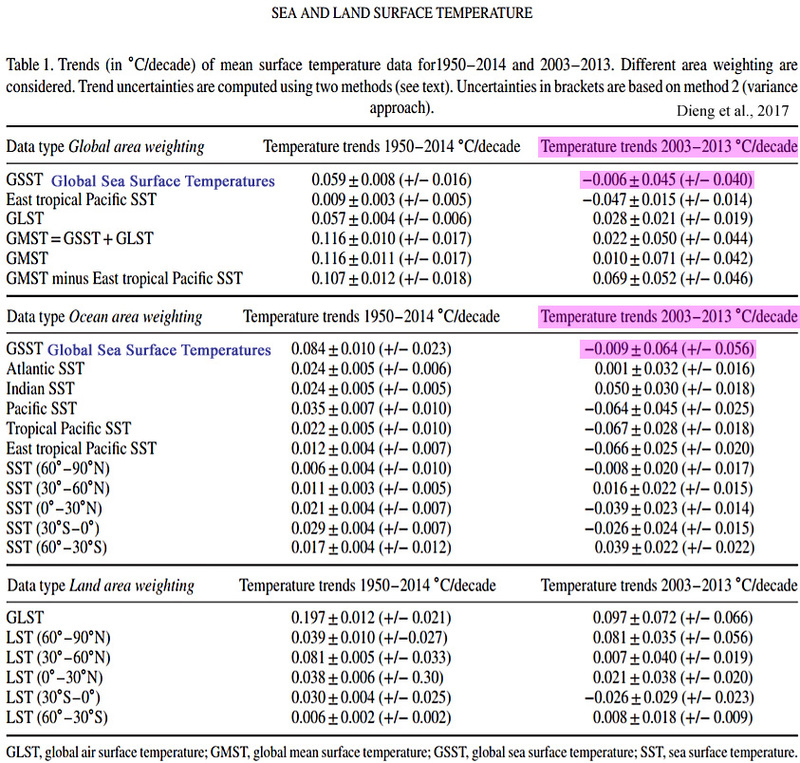 Decadal OHC and SST trends reversed sign around 2004–2005, with a strong warming seen during 1994–2004 and marked cooling observed over 2005–2015. These trend reversals were pronounced (> 0.1 °C yr−1 in magnitude) in the northeastern North Atlantic (south and west of Iceland) and in the Labrador Sea. … To identify basic processes controlling SPNA thermal variations, we diagnose the SPNA heat budget using ECCOv4. Changes in the heat content of an oceanic control volume can be caused by convergences and divergences of advective, diffusive, and surface heat fluxes within the control volume. [Advective heat convergence] explains 87% of the total [ocean heat content] variance, the former [warming] showing similar decadal behavior to the latter [cooling], increasing over 1994–2004, and decreasing over 2005–2015. … These results demonstrate that the recent SPNA decadal trend reversal was mostly owing to advective convergences by ocean circulation … decadal variability during 1993–2015 is in largest part related to advection by horizontal gyres. Yeager and Robson (2017) also point out that, like it did from the 1960s to 1980s, the North Atlantic “has again been cooling”, a trend which they and others expect to continue. Sea surface temperatures are no warmer today than they were in the 1950s. Yeager and Robson, 2017 [W]hile the late twentieth century Atlantic was dominated by NAO-driven THC [thermohaline circulation] variability, other mechanisms may dominate in other time periods. … More recently, the SPNA [sub polar North Atlantic] upper ocean has again been cooling, which is also thought to be related to a slowdown in the THC. A continued near-term cooling of the SPNA has been forecast by a number of prediction systems, with implications for pan-Atlantic climate. Latif et al., 2017 The Southern Ocean featured some remarkable changes during the recent decades. For example, large parts of the Southern Ocean, despite rapidly rising atmospheric greenhouse gas concentrations, depicted a surface cooling since the 1970s, whereas most of the planet has warmed considerably. In contrast, climate models generally simulate Southern Ocean surface warming when driven with observed historical radiative forcing. The mechanisms behind the surface cooling and other prominent changes in the Southern Ocean sector climate during the recent decades, such as expanding sea ice extent, abyssal warming, and CO2 uptake, are still under debate. Observational coverage is sparse, and records are short but rapidly growing, making the Southern Ocean climate system one of the least explored. It is thus difficult to separate current trends from underlying decadal to centennial scale variability. Turney et al., 2017 Occupying about 14% of the world’s surface, the Southern Ocean plays a fundamental role in ocean and atmosphere circulation, carbon cycling and Antarctic ice-sheet dynamics. … As a result of anomalies in the overlying wind, the surrounding waters are strongly influenced by variations in northward Ekman transport of cold fresh subantarctic surface water and anomalous fluxes of sensible and latent heat at the atmosphere–ocean interface. This has produced a cooling trend since 1979.